The week of Halloween, I didn't get anything done. I had taken a break from the 20k project and worked on something little fun for Halloween. I built a pop-up ghost head that took nearly a week to construct, using up my time for the 20k project. But the pop-up was worth the time so I didn't mind using up that week. Then it was November 1st... That was a date that I did not want to hear at all. That meant I had just over a month to finish the entire project; and I'm behind schedule. I had to kick into high gear and finish the squid scene, finale scene, entire interior, small parts and pieces for the other scenes, power grid, the second door, and about a hundred other little things. To top it off, I had a problem that would set me back quite a bit...the squid. When I was getting back to project after Halloween, my first thing to tackle was the characters to battle the giant squid. No problem, just need to figure out the scale. But when I was figuring out the scale of the scene with the completed squid in the scene, I noticed something was wrong--the deck was out of scale, too big. But then I realized that maybe the squid is too small instead. If that were the case, I really didn't want to redo it and make it larger; that would delay the entire project. Not knowing what to do with the set, I decided to shift gears and get the finale scene done and out of the way, then I can worry about the squid scene. It is a rather easy set to build so I was able to get it done quickly. I started off with a circular base and backdrop (the backdrop came out really well surprisingly). To give the appearance of waves crashing on the Nautilus, I paper mache-ed the base with crumpled aluminum foil and paper towels. The perspective for this scene will be really low, which means the set will be mounted very high, in order to achieve that horizon line effect with the ocean (trying to do that in miniature isn't easy, especially with the space allotted for this set!). This shot shows the perspective of the scene, with the crumpled aluminum form in the back representing Vulcania, framed by the waves. For the Nautilus I used another resin casting that I painted up and mounted in the set in the "sinking position". 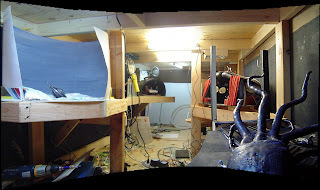 Here's a panorama of the entire "show building" at this point, showing the new set being built in it's place and the soon to be revised set in the foreground. I should also note that I have installed all of my work lights, fluorescent fixtures that will aid construction when I start putting up more walls and such. Once the paper towel had dried, I painted the ocean with a dark blue and fabricated the mushroom cloud from the exploding Vulcania. I made it out of the fake spider web material that is for sale just about everywhere around Halloween time. I mounted this stuff to a piece of card and lightly spray painted it with dark gray. At the bottom, I rigged some flashing LED's from a really cheaply made "strobe" light. I put a red and yellow gel in front of the lights for that fiery look. At this point I did a light test with the LED's only, and it looks really cool (I'm going to add more lights to give it a dusk feeling). 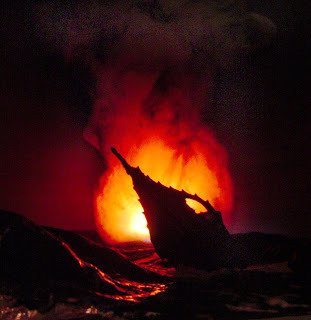 Here's an "artsy" shot that I did entitled "Death of the Nautilus and Vulcania", or something to that effect. I added some wave highlights and gave everything a glossy coat of Mod Podge which completed the entire scene. The set turned out way better than I thought, considering it was a pretty rushed scene. I anxious to see it under proper show conditions! Now that I got the Finale scene out of the way, it was back to the squid fight. When looking over what I had built already, I noticed that there was almost too much wasted space in the set around the squid and I felt that all the space should be filled up, considering this is suppose to be a spectacular scene. The size of the current squid makes the scene feel a little underwhelming for such a dramatic scene in the show. I decided that I really should make a new squid, one that fills up the entire scene. So thats what I did, I took out my now de-commissioned old squid and set to work on the new one. Here's the old squid soon to be replaced; note the amount of wasted space around the squid which prompted me to build a bigger squid. The new squid will be approximately twice the size as the old one, which is HUGE! To keep down the cost and weight, I made the entire new squid out of paper mache. I started with a rough crumpled paper form and gave it an aluminum foil skin. Once the foil was on, I covered with with paper dipped in a 50:50 water glue solution. Luckily I have a model to work off of this time! The squid will take a while to complete, since the paper mache technique requires dry time between layers. So, I've adjusted my schedule. The squid scene will probably be the last thing to be completed, simple as that. While layers are drying on the squid, I'm going ahead on finishing up the rest of the scenes and then once I'm all signed off on each one, the walls for the interior will start going up. I'll get into that in a future update. As for today, since I have the day off, I will be laying the power grid for the entire attraction. This took some planning since I need to get power to about 40 electrical sockets and I want to do it in a safe and organized way. There won't be any piggy-backing extension cords like in my previous shows! Nice job! Just one thing to note- the mantle of a squid is much longer. It looks great, just giving some biological info. Maybe you made it that way to save space. But who cares! Everything looks wonderful! Thanks! Yes, I do realize the mantle is much smaller than it should be-- and I did do that for space reasons! Also, because of the perspective, you wouldn't even see the mantle part of the squid that well, even if I did build it "anatomically correct". The squid is so large that it just pushes up against the wall of the scene. BTW, i like the dramatic lighting for the "final resting place" of the Nautilus.